It’s the most wonderful time of the year, and the Osborne Hotel will make it a Christmas to remember with our fantastic new function suite ready to host your Xmas Party. Whether it’s the work’s Christmas do, a festive family reunion or an all-out Xmas party with your friends, here at the Osborne Hotel we’ll provide a complete bespoke service that will let you celebrate Christmas however you like. We can host small dinners to big events in our exclusive Crescent Suite, with its own private entrance and terrace with breath-taking views of the Torbay coast. It doesn’t matter if you’re a group of friends or 130 work colleagues, we can cater for you all. Whatever the size or type of party, our advice for a perfect Christmas party is always to book early. ‘Last year was the busiest Christmas we’ve had,’ explains general manager Anthony George, ‘and we’re expecting the same this year, so the earlier you book the better. Now is the ideal time to book your Christmas party for 2017 as we still have some dates available to celebrate the festive time of year. We can accommodate all types of parties, whether you’re looking for a sit-down meal or just some drinks and a dance. By booking ahead you’ll stand a much better chance of getting prime dates like the final two Thursday evenings before Christmas (which in 2017 will fall on 14th & 21st December). These dates tend to be the ones that book out first – so make sure you’re in with a chance! There’s nothing worse than trying to plan a Christmas party only to find that the venue and entertainment you wanted are no longer available. So, minimise that risk through smart, forward planning. Organise your event way ahead of everyone else so you don’t miss out. We’ll help you organise the party, which means less stress for you as we lead up to the busiest time of the year. Our aim is for you to have a fantastic party full of Christmas cheer, a true experience to remember. For a bespoke party tailored to suit your needs, please give us a call on 01803 213311, email enq@osborne-torquay.co.uk or click here to fill out our contact form. The Osborne Hotel is only a stone’s throw from Meadfoot Beach, where you can soak up the sun to the sound of crashing waves. But we know there’s probably a few other things you’d like to do during your stay as well, so we’ve compiled a short list of the best local attractions to keep you active and entertained during your visit. You will feel like a giant as you explore the four-acres of award-winning gardens that show hundreds of model scenes, vehicles and people. Babbacombe Village is famous for its miniature landscaped gardens almost as much as its model villages and is one of Torquay’s top attractions, ranked number one on Trip Advisor for ‘things to do’ in Torquay and on the English Riviera. Adults love the humorous representation of British life over the last six decades and the award-winning gardens, while children love the miniature characters and enjoy following the spotter sheet to see what they can find. It’s a must-see while visiting Torquay. Kents Cavern is a cave system in Torquay, Devon, England. You can explore the caves and learn all about human history and how our ancestors survived nearby. There’s a summer of prehistoric-themed fun this year where children can join the Stone Age School gane in the woodlands and discover pebble decorating, pouch making and spear throwing. You will also get to handle stone-age artefacts and make your very own stone-age pendant for your stone-age necklace. You can travel back 400 million years with a visit to Torquay Museum, which is a family-friendly attraction with lots of hands-on activities for children and adults alike. Come face-to-face with North-West Europe’s oldest human fossil and the sabre-toothed tigers he shared his Torquay home with 44,000 years ago, and explore life and death in Ancient Egypt, including the coffin of a 2,500-year-old mummified boy. Find out about Torquay’s explorer’s, including the inspiration for Indiana Jones and what life was like in an Devon Farmhouse in the 1800s. You can also detect your way through Britain’s only Agatha Christie gallery at Torquay Museum, which is dedicated to the life story of the Queen of Crime. Living Coasts, Torquay’s award-winning coastal zoo and aquarium, is home to an array of marine life from around the world. Set in a state-of-the-art naturalistic environment, you can journey from the South African coast to a mangrove forest and then onto a sunken wreck. On your visit you can mingle with the playful penguins, get up close with the otters and come face-to-face with the seals. In the aquarium you will see fish species from around the world while you’ll see birds in the Wader’s Estuary foraging in the grass and the shallow waters for insects. With a host of events and activities throughout the year, you are sure of a great day out whatever the weather. Paignton Zoo is home to some of the planet’s rarest and most amazing creatures including gorillas, orangutans, giraffes, lions, tigers and rhinos. There are also hundreds of rare and beautiful plant specimens around the site. At Crocodile Swamp you’ll come face-to-face with huge crocodiles and large snakes, turtles and fish and don’t miss Amphibian Ark or Monkey Heights. Paignton Zoo is a registered charity, so not only do you get a good day out, you know your money is going to a good cause, supporting education, scientific research and practical conservation both at home and abroad. If you want to visit Torquay then book one of our sea-view rooms directly with us for the best possible deals. Click here to book now. You may say we’re biased but we believe Torquay has the greatest beaches in the whole of the UK and the one at the end of our gardens is the best. Meadfoot Beach is the jewel in Torquay’s crown and the perfect place to visit if you’re looking for a relaxing, quiet coastal holiday. As an owner of the prestigious Blue Flag, Meadfoot Beach’s water is tested annually by the Environment Agency and comfortably passes each time. It’s not only the water that’s tested though. Meadfoot Beach is also marked highly against a number of factors including safety, litter management, available facilities and access for everyone. That means the only thing you need to worry about on your seaside trip is the sand in your sandwiches, although you can always join us for a fantastic sea-view lunch on our Terrace. From the Terrace you can soak up the fabulous views of Meadfoot Beach’s sand and shingle coastline surrounded by awe-inspiring cliffs, watch holiday-goers enjoy the pedallos or canoes, all while you enjoy a relaxing drink. You can take a slow walk through our beautiful gardens down to Meadfoot Beach from the Osborne Hotel but that’s not the only activity to get up to on your visit. The local area boasts a whole range of attractions to keep you occupied and entertained during your stay, from Paignton Zoo to Kents Cavern cave system to name just two. Click here to find out more about the local attractions on the official Osborne Hotel website. Murder mystery fans will also enjoy the world-famous Agatha Christie Mile, which makes for a fantastic trip for Christie fans. You can see where the renowned writer swam, danced and crafted her best-selling novels. Meadfoot Beach really is a hidden gem on the UK coastline. Most visitors to Torquay usually head to the often-crowded Babbacombe and Torre Abbey, while in-the-know locals head to Meadfoot when the sun’s shining. If you would like to come and visit one of the UK’s best beaches and stay in the exclusive Osborne Hotel, then don’t forget to book direct to get the best offers. We will look after everything during your stay and have a range of rooms to suit your needs. Take a look at our superior sea-view rooms for the complete Osborne experience. Click here to book your room now and make Meadfoot Beach your new favourite UK coastal break. With its award-winning beaches and picturesque countryside, it’s little surprise that there is a wealth of scenic walks along the English Riviera. From gentle walks for beginners to challenging routes for keen ramblers, there’s something to suit everyone. Spanning 630 miles along the stunning south coast, this is the longest national trail in the country. It begins in Minehead, Somerset and runs through to Poole Harbour, crossing the Exmoor, North Devon, Cornwall and Dorset coasts along the way. The stretch through Torquay passes right outside The Osborne Hotel, along Meadfoot Beach. Pick up the path from any point and take in some of the most spectacular views of the south west. There are many things to look out for – visit the South West Coast Path website to find out more about the heritage, wildlife, geological and cultural points of interest. Discover the history and culture of South Devon on this trail. Scattered across the English Riviera, from Maidencombe down to Berry Head, are 49 blue plaques that mark notable sites and residencies of famous figures throughout history. Sites include Rock House in Torquay, where Rudyard Kipling spent two years, and Hesketh Crescent, where Charles Darwin spent some time – right next to our hotel! You can download a map of the plaques from Torbay Civic Society. Explore every nook and cranny of the dramatic coastline with this self-guided walk along the Babbacombe coast. Starting at Anstey’s Cove and finishing at Babbacombe Cricket Club, it’s a 4.5 mile walk along challenging paths that are quite steep at times. You’ll pass many points of interest, including Withy Point, Gasking’s Rock and Devil’s Point. You can take a slightly gentler route from Anstey’s Cove along the Torquay Coral Coast. There are still a few inclines, but the route is mainly along the even coastal path. Enjoy the spectacular rock formations and wildlife along this 5.6km route. Further inland from the coast is the stunning Dartmoor National Park. If you like hiking, then this is the place for you. There are a number of circular walks, taking you to the finest viewpoints of the park. Worth a mention is the Moors & Tors of Eastern Dartmoor – a 22.5km route, along which you can experience the beauty of the wilderness without straying too far from public roads. For a shorter stroll, take a gander along Torquay’s Agatha Christie Mile. See the sights and places from her early years that inspired some of her famous works, such as the Princess Pier where she enjoyed roller-skating as a child, and The Pavilion where Archie Christie proposed to a young Agatha. You can also arrange guided tours on request to discover even more about the best-selling novelist. After all that walking, you’re sure to work up an appetite! Join us for lunch or dinner at our newly-refurbished restaurant, The Crescent. 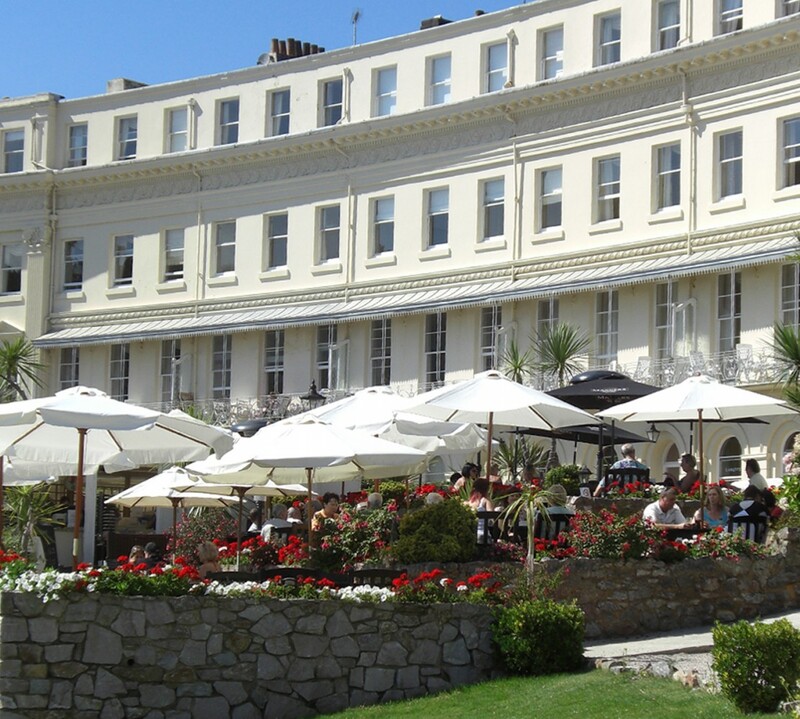 Or you can dine al fresco on The Terrace and enjoy breath-taking views of Torbay. Torbay’s mild micro-climate makes the average temperature warmer than the rest of the UK all year round. Take full advantage of it and bask in the sunshine on one of the glorious beaches. Grab a bucket & spade to build sandcastles on Torre Abbey Sands or collect shells and pebbles on Meadfoot Beach. If you’re more of an adventure-seeking family, try your hand at coasteering or climbing with Reach Outdoors at nearby Goodrington Sands, Paignton. Celebrate the UNESCO-recognised Global Geopark at the Geopark Festival 2017. There are various activities happening throughout the week. Take a trip to Occombe Farm where you can discover the secrets of the Geopark (27th May – 4th June) or let the little ones play chef at the Marvellous May Kids Cookery event (30th & 31st May). Explore the sights of the English Riviera, from Torquay to Paignton, on an open-top bus tour. Or, take in a stunning 360-degree view of Torbay with a ride on the iconic English Riviera Wheel. Located in the picturesque Princess Gardens, the wheel is taller than Nelson’s Column – measuring 60 metres! The Osborne Hotel is perfectly located to enjoy all the best that Torquay has to offer. Plus, with unrivalled sea views, indoor and outdoor swimming pools, tennis courts and restaurant, you’ll have just as much fun back at the hotel! Check availability. The town’s inhabitants resided in the coastal caves, now known as Kents Cavern. The caves are one of Europe’s significant Stone Age sites, with rocks dating back 400 million years. Unsurprisingly, Kents Cavern is a key tourist attraction and visitors can take a guided tour to learn all about the 15-year-long Victorian excavation, led by local archaeologist William Pengelly, that unearthed the caves’ history. Tourists can continue their voyage of discovery, with a trip to Torquay Museum where more than 500 stone tools are on display – many of which were found in the excavation. Torquay’s major phase of development occurred in the 1800s. The Palk family were notable residents and owned much of the land in Torquay during this era. It was under the Palks that a new harbour was built in the early 19th century which increased Torquay’s importance as a fishing town. It was in the second half of the century however, that Torquay came to be known as a popular leisure destination. As seaside holidays became fashionable among the upper classes, Torquay’s mild climate made it one of their preferred holiday spots. The Osborne Hotel also has its roots in the 19th century developments. It was Sir Lawrence Palk, 4th Baronet, who commissioned the construction of Hesketh Crescent; the grade II listed Regency crescent building we call home. Completed in 1848, it’s a fine example of 19th century architecture and is said to be one of West England’s most elegant crescent buildings. Aside from Hesketh Crescent, there are many significant historic buildings in the town. Torre Abbey was founded in 1196 as a monastery. Dissolved in 1539 during Henry VIII’s Reformation, today it’s home to four floors of art exhibitions, heritage and interactive displays. A mile from the seafront, you’ll find Cockington Court – a stunning manor house built in the 16th century. Now it’s more commonly known as a thriving crafts centre with over 20 studios. The house is open to the public along with its beautiful walled and Tudor rose gardens. Torquay’s most famous resident is probably crime novelist Agatha Christie. Born in the town in September 1890, her childhood home provided much inspiration for the setting of her popular crime mysteries. Fans of the author can discover more about how Torquay influenced her work with a walk along the Agatha Christie mile, which includes the Princess Gardens and Beacon Cove. Experience the wonder of Torquay yourself with a stay at our seafront hotel: check availability. What’s on this Easter in Torquay? Just a short drive from The Osborne Hotel, you can treat the kids to something a little different with this underground experience. There are daily tours of the caves plus exciting activities including the Dino Quest – see if you can find the dinosaurs hidden around the site. And your visit wouldn’t be complete without taking part in the Easter Egg Hunt! Distance from the hotel: 5 minute drive. Step back in time with a trip to Bygones. Three floors showcasing over 100 years of British history, from the Victorian Era to Wartime Britain. Get involved in this year’s Easter Egg Hunt, taking place 1-17 April. Distance from the hotel: 10 minute drive. If you’ve got some adventurous little ones on your hands, feed their curiosity with a visit to Cockington Court. Grab one of the Court’s backpacks full of activities when you arrive to keep them entertained. There are packs suitable for under 5s and 6-9 year-olds, available 11am – 3pm. Distance from the hotel: 15 minute drive. Explore the story of Torquay whilst getting out and about in the spring sunshine. On this self-guided two mile trail, you can take your time – simply follow the directions to stay on the fixed walking route. The kids will be kept engaged with clues to solve en route. Pick up the trail from Vaughan Parade. When you’re ready to relax after your fun-filled activities, why not stop by our hotel and enjoy a traditional Devonshire cream tea for a true taste of Torbay?